Change of ownership. 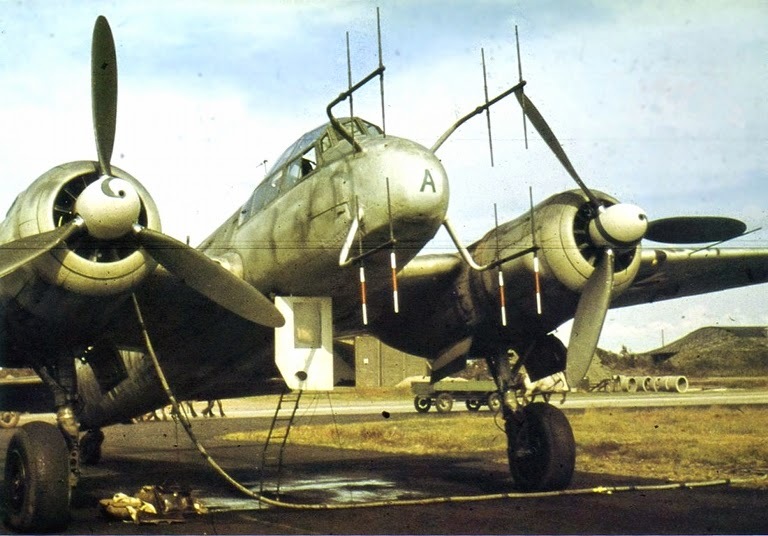 A party of RAF ground crews are servicing this Ju 88A-5 belonging to the 'RAFWAFFE' - a group of captured airworthy Luftwaffe aircraft flown and demonstrated around Allied air bases in Britain. Bomber was originally 4V+ GS of III/KG 1 that force-landed at Steeple Morden on 16 February 1941. The rear sets of undercarriage doors normally remain in the closed position when the wheels are lowered. During World War II, exhaustive tests were carried out on all airworthy Luftwaffe machines falling into British hands. Most major variants of the Ju 88 formed part of this collection, ranging from an A-1 acquired during 1940, and culminating with the G-1 example arriving in July 1944. Each was flown by future test pilots of post-war note who were already entering this career on either side of VE Day. Ju 88A-5 Capt Eric 'Winkle' Brown first got his hands on a Ju 88A-5 variant during late 1943, this aircraft having inadvertently landed at Chivenor in 1941. Brown's initial impression upon entering was that a crew of four would make for extremely cramped personal conditions. More noteworthy, given his small stature, was the very generous fore-and-aft seat adjustment. This was a positive factor compared to most Allied military aircraft, where in Brown's view the seat-to-pedal arrangement proved to be almost totally in favour of large pilots! One limitation relating to the otherwise sound controls layout involved the engine throttles. These were placed too far back and too low, requiring the pilot to change his hand action from a pull to a push position - not the best of arrangements during what was a critical phase of any flight! Engine start-up of the Jumo 211 G-1s could be achieved internally using the electrically energized inertia starters, or through use of a starter trolley, the latter sparing the draining of the Ju 88's batteries. Taxiing was easy thanks to quick responding brakes and an unlocked tail-wheel; it was locked prior to take-off, otherwise operation of the hydraulic system was impeded. In addition the oil and coolant radiators had to be fully opened during this stage of the sortie. For take-off the flaps were set one-third open, and the radiator gills closed to a similar degree. Rudder and aileron trim-tabs were set at 'zero', and elevator trim-tabs set for a marginal nose-heavy configuration. On opening up power Brown's experience was that differential throttle movements could easily induce a swing if power was applied too rapidly. Also, considerable forward pressure had to be applied to the control column in order to lift the tail up and gain full rudder response in so doing. Once in flight, both rudder and ailerons proved very responsive throughout the entire range of speed applied to the Ju 88. The automatic tail incidence control was of material assistance when noticeable elevator movements were called for; this system was linked to the dive-brakes in a manner that placed the elevators in the 'dive' mode and returned them to 'level' when the dive-brakes were opened and shut. Two incidental advantages of the system lay in the fact that the pilot could avoid having to ensure the propellers did not over-speed during the dive, and did not have to rely upon muscle power to regain level flight! Ju 88G-1 Wg Cdr Roland Beaumont was attached to the Central Fighter Establishment's tactics branch at Tangmere following his return from captivity. On 14 July, having read up his notes on the Ju 88G-1, he climbed up rather apprehensively into the cockpit. His initial impression was of restricted vision thanks to the canopy framing. On the other hand, the controls and instrument layout largely met with his approval excepting the fuel system, which he regarded as complex. Engine start, produced a pleasant noise level, but this turned to a harsher note as power was applied. Movement of the controls displayed smooth and immediate response, but Beaumont felt that the nose-up attitude while taxiing made him feel uncomfortable. Once airborne, however, he quickly adapted to handling what was one of his first multi-engine experiences, most of his flying having hitherto been in single-engine fighters. The take-off had proved surprisingly easy. Power had been gently applied to counteract any tendency to swing, but the machine lifted off before reaching 100 per cent effort, and required no further elevator action other than that previously applied to lift the tail up. Once the undercarriage was raised, the subsequent climb-rate applied was comparable to its RAF contemporary the Mosquito. Control response was very good, while, after levelling out and holding a speed around 370kmph (230mph), minimal rudder and elevator trimming was required. Beaumont then put the Ju 88 through a series of manoeuvres ranging from partial rolls and tight turns and dives, to climbs and wingovers. None of these actions raised any material control problems, but the dives reaching 300 IAS did produce an enhanced and distracting noise-level. The landing approach was made marginally faster than the pilot's notes indicated until over the runway threshold, and the touch-down proved as smooth and uneventful to Beaumont as any other aspect of the flight.